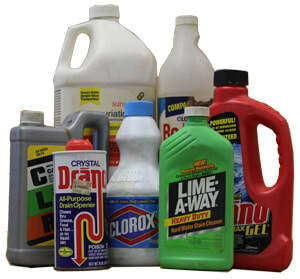 Household Hazardous Waste encompasses a variety of toxic substances banned from the landfill. To help you properly dispose of household and small business hazardous waste, we offer multiple annual events throughout the district from Spring to Fall. Collections are open to residents of all member towns. * Fees are $20 per car load for most residential loads. Hazardous waste from non-district residents will be accepted at a fee of $100 per car load. *Please note: Schools and small businesses must call ahead to pre-register for these events. Small businesses must be a Conditionally Exempt Generator (CEG). Learn more at the State of Vermont's website. To register as a CEG, call our Operations Manager at 802-229-9383 X 105. ​What is Household Hazardous Waste? Keep items out of reach of children and pets. If possible, store items away from living spaces. Make sure all lids and caps are tight to prevent the product and vapors/odors from leaking into living spaces. Keep items away from: heat sources (for safety), freezing temperatures (to prolong product life), and flood prone areas (to prevent contamination of water and soil). What's the best way to handle hazardous waste? Create Less!